I have a philosophy of not judging movies based on what they're about. Whether I agree or disagree with the subject matter, I try to look at it on its own artistic merit. With that said, I'm only human and am naturally drawn to things that reinforce my beliefs. But sometimes, a movie arrives too late to the party to have any real significance and I find myself distanced from the message despite my agreeance with it. Such is the case with Green Zone. The film takes place in the early days of the Iraq war, in March of 2003. Matt Damon plays Miller, a soldier in charge of finding weapons of mass destruction. Despite the intel that tells them where to go, he and his squad have come up empty handed multiple times. He begins to get frustrated going on these wild goose chases that are putting him and his men in danger only to find nothing, so he confronts Clark Poundstone, played by Greg Kinnear, head of Pentagon Special Intelligence, who assures him that the weapons are indeed out there and they will find them. Nevertheless, something seems fishy and he begins to suspect the war in Iraq was started unjustifiably. With the help of CIA chief Brown, played by Brendan Gleeson, he hopes to uncover the true reason he is there. Iraq war movies are no strangers to the film community. Stop Loss, In the Valley of Elah, and the recent Best Picture Oscar winner The Hurt Locker all have explored the war in different ways, some delving into the manipulative ways our government can keep our soldiers active despite their military term ending while others have explored the affects war has on those fighting. They are focused, meaningful and bring up important issues that the public may not be aware about. Green Zone is the opposite. It's a two hour Bush bash with the oft-heard message, "America entered into Iraq on false pretenses," thanks to our inability to find WMD's. Anyone familiar with the goings-on of the world already knows we were unable to find the weapons, so this becomes little more than an exercise in the blame game that tries to remind us how we got involved to begin with. I feel much about this the way I did about the economic downturn. Some blamed President Clinton, some blamed President Bush, but whose fault it was seemed unnecessary to me. Let's just fix it. The message, however important it may be, is too late to the game. Had this been released three or four years ago, its impact would be hard to ignore, but now it seems like a childish indictment of a man many conservatives have even come to dislike. It is necessary to know how we got to Iraq, what mistakes we made along the way and how we can avoid them in the future, but dwelling on how we got there isn't as important right now as focusing on how to get out. Director Paul Greengrass, the man behind The Bourne Supremacy and The Bourne Ultimatum, directs this in a similar style, the nauseating 'can-you-not-hold-still-for-one-second?' shaky cam style. As solid as his film's are, he has a tendency to go a little overboard with it and by the end, I was queasy and my head was pounding. It felt like somebody had been chipping away at my skull with a chisel for two hours. There's a fine line between using the shaky cam technique for realism and overdoing it to the point where you remind your audience they're watching a movie. When you cut to a man typing at a computer and the camera is still shaking back and forth like its mounted on somebody's shoulder, it's doing the opposite of its intended purpose. 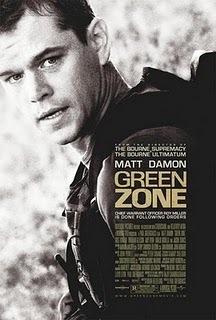 I have many a problem with Green Zone, but in the end I'm still going to give it my seal of approval. Regardless of its relentless shakes and the message arriving a few years too late, it's often exciting, always entertaining and Matt Damon, as usual, is rock solid as the lead, giving another award worthy performance. Unfortunately, it's too worried about further crippling Bush's reputation to be bothered with saying something relevant.